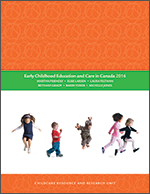 This BRIEFing NOTE updates a previous document titled Proposed changes to child care regulations - Ontario 2014. Like the previous version, this document is concerned with specific elements of child care regulations proposed by the Ontario government. These—like the 2014 proposals (which were withdrawn by the government following community objections)—would significantly affect provision of child care in Ontario. Although the government’s February 1 2016 posting includes a wide range of regulation changes, this document specifically covers only proposals for changes to age grouping, especially for the youngest children and elimination of home visitors’ caseloads in regulated home child care.